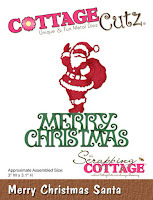 The Design Team has been bringing you some fabulous samples with the new CottageCutz Christmas 2016 dies. I hope you are being inspired to start thinking about your Christmas cards. I love Christmas time and all the festivities that go with it. And, I love making Christmas cards. I usually send out around 60 handmade cards each year. I am always on the lookout for cards that can be mass produced. That is where I am taking you today. I am showing a card that would be easy to make a lot of for card giving. So let's get started with the details on my project. I am also showing a technique that I tried for the first time and just love the outcome. It's a resist technique requiring just a few simple steps to create a shimmery background. I thought it would be perfect as a backdrop for the Christmas cardinals. It reminded me of a snow squall. I found this tutorial on Splitcoaststampers. Basically here is what I did. Turquoise Card Base: 5 1/2" x 4 1/4"
Background Panel: 5 1/8" x 3 7/8"
1. You need some metallic white paint. I used DecoArt white pearl dazzling metallic. You use cling wrap and crumple it to use as the applicator for the paint. You will need to use either a craft mat or paper to protect your work surface. This technique gets a little messy. 2. I squeezed a small amount of the paint on my craft sheet. Dip the plastic wrap into the paint and pounce it on the craft sheet a few times to work it into the cling wrap and also to remove excess paint. Then you tap it lightly onto your cardstock. Repeat this step until you have your cardstock covered. I left some open area on my cardstock because I wanted the look of snow. 3. Once you have applied the paint where you want it, set your cardstock aside to dry. 4. Now it's time to start adding your ink. You can use a sponge, blending tool or even a brayer. I used a sponge on my cardstock. The ink color is turquoise. 5. I applied the ink all over my cardstock. As you are applying ink your metallic design will start showing through. The paint will resist the dye ink. Once you have the look you want, take a paper towel and buff the cardstock to remove the ink that is laying on top of the acrylic paint. Then you will see more of the metallic paint design. This creates your faux Mother of Pearl design. I created several of these backgrounds and it was tough getting a good picture. This background I didn't use on my finished card but it was the one that cooperated with my camera. 6. 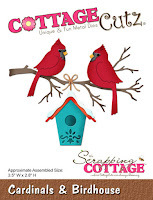 Now that the background is prepared, I decorated it with the Cardinals and Birdhouse dies. The Merry Christmas sentiment is from the Christmas Santa die set. I used multi-matte adhesive, and dimensional adhesive to attach the die cuts. Well, that's it for me for another week. I hope you have been inspired to give this technique a try even if you aren't making your Christmas cards yet. And. don't forget our birthday challenge is still running until 8-31-16. Get details here. Very pretty. Love the faux mother of pearl background you created. Thanks for sharing the tutorial. I also appreciate your taking the time to photograph the steps, as well as to talk us through how you created this beautiful background. I'm off to play as I think I own some of that pearalized paint. I love the background Mary...your card is so pretty! This technique is great. Beautiful card. Love the technique I may try this!